offer only solutions of excellence. Our furnishings are reaized exclusively with plywood panels or blockboard. They form a safe skeleton, durable and strong, suited to be varnished or veneered. We have decided to not use chipboard panels or panels so-called ennobled. They don’t tollerate humidity and, bathing themselves,their structure swells removing also the overlying coating. These materials can also contain heavy and dangerous metals for the health, caused of wood waste and others materials’ contamination from where they are produced or protective treatments to which they are subjected. Finally, the chipboard is an unrepairable material because its nature is against the crumbling. Plywood laminated poplar, solid wood for traditional doors or strip panels covered for those most decorated. Or steel, cristal, corten and even more. Each type of door needs an adequate support. You choose the aspect, we guarantee the quality. We wait you in our company to taste yourself products, wood and colours with which you colud personalize your furnishings. An excellent worktop must be indestructible. Choose between the resistant laminate, the traditional marble or the hot oak plywood. If you search the best, come to discover Corian®. The choise of worktop, and consequently of protective seatback, is not a secondary selection. An excellent material, together with professional mounting and sealing, guarantees not only a extended duration of the whole kitchen but it lets a easy daily use of it. 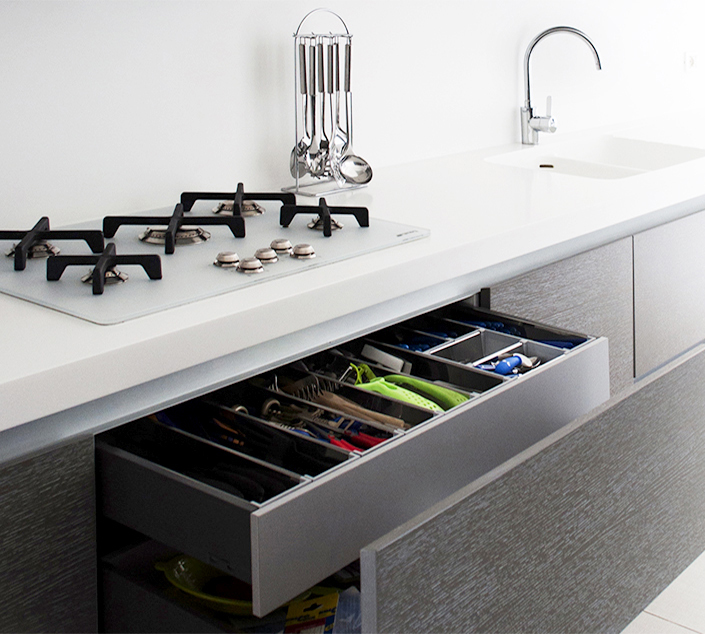 For this reason we recommend you Corian®. We support the intelligent and responsible technology which could be an efficient allied in your homes. We use only evolved, silent and efficient hardware. Let us to recommend you our electrical aplliances and technologic devices, tailor made for your spaces. And if you had particular request, we would be ready to satisfy it. In our virtual showroom, you are the designer. Imagine to enter in your home and can instantly personalise spaces, changing shapes, colors and texture to your furniture, everything with easy touches, without worring about cannot coming back. You can do it with us, through the Virtual Showroom, the instrument with whom our architects will allow you to live directly the evolution of your spaces.